Life Insurance, in all its manifestations, seems a technical concept to many of us and thus we choose to overlook the nitty - grittiness of an insurance plan even when we are investing in the same. Call it the lack of awareness or the technical jargon used in the policy details, an average customer only concerns himself with the benefits he would receive and the premium he is supposed to pay. Is the sentiment ringing any bells in your psyche? Aren’t you too suffering from the same ignorance and are more interested in the plan benefits than the plan itself? You might be as most of us Indians are and so, through the article let us un-complicate the meaning of a life insurance policy and its various facets too. A life insurance policy is a contract between the insurance company and the person buying the plan called the proposer. The company undertakes to cover the death risk of the proposer himself (who becomes the person insured and policyholder) or another member (person insured) for whom the proposer is buying the plan and paying the premium (the proposer then becomes the policyholder). In exchange for the risk undertaken by the company, the policyholder promises to pay a specified amount (premium) to the company. This amount depends on the insured’s age and the Sum Assured (the amount of coverage). – This is the amount of coverage under the insurance plan. This would be the amount which would be payable on death of the insured. The choice of the sum assured rests with the policyholder and the company decides whether to accept the chosen Sum Assured depending on the insured’s risk profile. – Also known as the plan term, this is the period for which the company undertakes the risk on the insured’s life. The choice of the tenure too lies with the proposer. He can choose any term suiting his financial requirements. – Premiums are payable by the policyholder and are always paid in advance. The rate of premium is calculated based on the age of the insured, the level of Sum Assured chosen, gender of the insured, the premium paying frequency and the chosen plan term. – Though premiums are usually calculated on an annual basis, the policyholder might choose to pay premiums in half-yearly, quarterly or monthly modes. Though the half-yearly premium is usually half of the calculated annual premium, the quarterly and monthly premiums are usually higher than the proportionate annual premiums. Furthermore, the chosen frequency too affects the rate of premium. – Every insurance plan has a specified entry and exit age. The entry age has a minimum and a maximum limit and specifies the minimum and maximum age criteria for availing the policy. Exit age also has a minimum and a maximum limit and specifies the maximum age beyond which the policy couldn’t continue. – Every life insurance plan has a compulsory death benefit (except Immediate Annuity Plans). Other than a pure term insurance plan, every life insurance plan has a maturity benefit too. While the death benefit is payable on the death of the life insured, the maturity benefit is payable if the chosen plan term completes and the insured is alive on such completion. There is also a concept of survival benefits which accrue under a Money-Back Plan. Survival Benefits are paid periodically during the plan term in such plans if the insured is alive on that date. – A life insurance plan can either be a traditional insurance plan which promises guaranteed benefits or a Unit Linked plan where the benefits paid are non-guaranteed and linked to the market. More knowledge of the types of insurance plans would become clear when we discuss the various types of a life insurance policy available in the market. – Traditional life insurance plans might be issued as participating plans which earn bonuses or non-participating plans where bonuses are not declared. Bonus is nothing but a part of the profits earned by the insurance company by investing the accumulated premiums. Since the returns are generated on the premiums paid by policyholders, bonus is paid back to them. – A term plan is the most basic insurance plan. It covers only the death risk of an individual and does not provide any maturity benefit. – These are a slight variant to the above-mentioned term plans. Where term plans do not have any maturity benefit, return of premium plans pay 100% of the aggregate premiums paid under the plan if the plan attains maturity. Some return of premium plans also pay a higher percentage of the premiums paid on maturity. – Like term insurance plans, whole life plans also primarily cover an insured’s death risk. As the name suggests, these plans cover the individual for his entire lifetime compared to term plans which run for a stipulated tenure. The cover ceasing age in whole life plans is 100 years. – These plans are savings oriented plans which provide coverage against death and also create a saving. Guaranteed death and maturity benefit are payable under these plans and in most cases bonuses are also paid. – They are similar to endowment plans as they also pay both - maturity and death benefits. But while endowment plans lock in the investments for a longer tenure, money-back plans pay a fixed percentage of the sum assured at regular intervals throughout the chosen term if the insured is alive at such intervals. – These plans are designed for securing the child’s future and can be offered either in the endowment plan version or the money-back version. The unique feature of a child plan is the inbuilt premium waiver rider. Under these plans, the parent is the insured and the policyholder while the child is the beneficiary. If the parent dies during the plan term, the plan doesn’t end. The death benefit is paid and the plan continues. Future premiums are waived off and on maturity the maturity benefit is also paid. Thus, these plans ensure that the child’s future is mot marred due to a financial crunch. – These plans are retirement oriented plans where annuity payouts are provided till the lifetime of the annuitant. There are two types of pension plans – Immediate and Deferred Annuity Plans and the plan benefits depend on the type of plan selected. – The latest insurance trend are the unit linked plans which invest the premiums paid in capital markets thus generating handsome returns. These are flexible plans which allow partial withdrawals during plan term, additional infusion of premiums through top-up facility, etc. 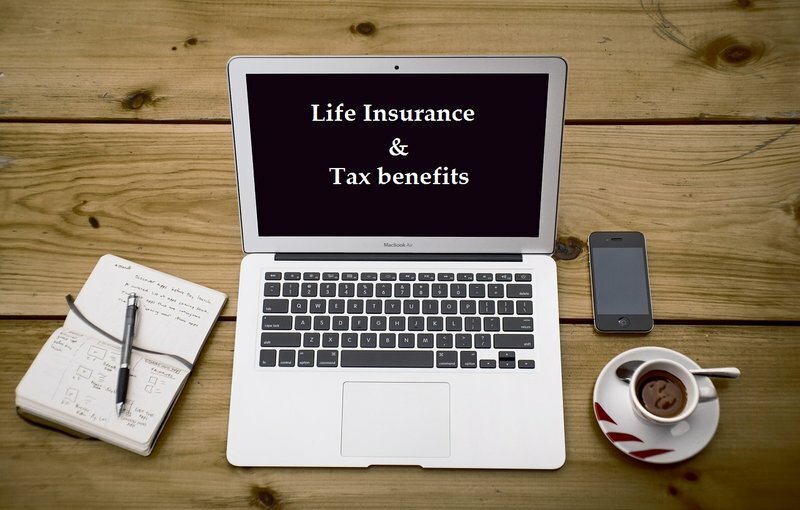 People usually associate a life insurance policy to the inherent tax relief they provide. As such most insurance investments are done with a view to save tax rather than to meet life’s goals. Though people are gradually becoming aware about the importance of various insurance plans, they have a long way to go to completely accept insurance for the actual tax benefits it provides. - However, speaking about the tax reliefs, insurance plans allow an individual to save taxes. Premiums paid for buying an insurance plan is exempted under Section 80C of the Income Tax Act 1961 up to a limit of र 150,000 (Rupees One Lakh and Fifty Thousand only) as per current regulations. - Similarly, the amount of sum assured along with bonus paid on maturity or surrender of the policy or on the death of the life insured are completely under Section 10(10D) of the Income Tax Act 1961. Under this section, any policy where premium payable in any year is more than 20% of the actual sum insured and it was issued after 1st April 2003 but on or before 31st March 2012 the policy maturity proceeds would be taxable in the hands of the insured. For policies issues on or after 1st April 2012, the above mentioned limit of 20% has been changed to 10%. However, in case of death of the life insured, the policy proceeds received by his nominee shall be tax free even if premium paid in any year crossed the prescribed percentage of sum assured. – Section 80CCC was introduced to encourage investors to invest in pension funds and secure their future. This section provides for income tax deduction for contribution to pension funds. The aggregate amount of deduction of this section along with Section 80C should not exceed र 150,000 (Rupees one Lakh and Fifty Thousand) in a financial year. Term plans are the most important insurance plans which are essential in one’s financial portfolio. These plans are dirt cheap and allow you to avail a large coverage at minimalistic premium rates. Thus, these plans aptly fulfill the income protection requirement of an individual and provide a substantial lump sum amount (in the form of the high Sum Assured level available) to the insured’s family in case of his untimely death. Thus, a life insurance policy is a must and necessary addition to your portfolio and a term plan should have a place therein as that is the best and simplest way to protect your family in case of any unfortunate circumstances arising out of your death. You can easily buy term plan online and enjoy the benefits. And don’t forget, a life insurance plan, including a term plan saves taxes too as discussed above.